Two car dealerships in Derby have received awards from the Motability Car Scheme in recognition of their continued delivery of excellent customer service. Bristol Street Motors Fiat and Citroen, both situated on Sir Frank Whittle Road, have received Dealer Awards for their work with the Motability Car Scheme, an initiative which enables disabled people to maintain their independence by providing specially adapted vehicles. The Dealer Award, which is part of a programme launched by Motability Operations, is assessed using customer feedback and reviews of the dealership's performance. It recognises and rewards outstanding customer service provided by Motability dealerships throughout the UK. This is third time that the Citroen dealership has received an award from Motability, having won the Dealer Award for the two previous quarters thanks to the positive reviews it received from its Motability clients. Peter Wilson, General Manager - Dealer Relations at Motability Operations, said: "The focus of these awards is to thank our dealer partners for providing a consistently positive customer service experience, after all, they are often the first point of contact for our customers. "It's important for us to recognise our dealer partners who go above and beyond when representing the Motability Scheme and highlight those who are setting a great example of how to do it well, like Bristol Street Motors. Many congratulations to the dealerships on their awards." 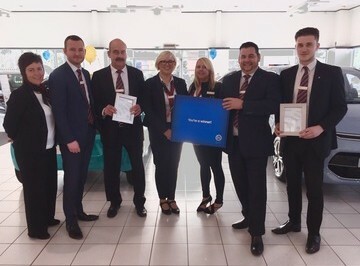 David Orriell, General Manager at Bristol Street Motors Fiat Derby, said: "Everybody at the dealership is extremely proud to receive this Motability Dealer Award. It's an honour to have been recognised for our dedication to customer service. We look forward to building on this success and continuing our award-winning approach to business and customer service." Jason Reynolds, General Manager at Bristol Street Motors Citroen Derby, said: "We're very pleased to have received our third award from Motability Operations. It's a sign that we are providing the excellent customer service that Bristol Street Motors is renowned for. "We have many customers who return time after time to purchase their Motability vehicles from us. Each of their requirements are unique to them and we always do our utmost to go the extra mile to ensure that those requirements are met."